By LUDWIG VON KOOPA - The Rabbids had to come sometime... but Donkey Kong is here, too. We really do not like the Rabbids. Unfortunately, Nintendo and Ubisoft are teaming up to force the Rabbids and Donkey Kong to team up, and we have to witness this. “We” being myself, Donkey Kong fan RawkHawk2010, and Wendy. At least the tail-end of the log has some Super Smash Bros. Ultimate? You know by now that we consider the E3 Weeks 2018 Schedule to be a very helpful resource. Hopefully you do as well! [3:07 PM] RawkHawk2010: ...it's Rabbids. [3:08 PM] RawkHawk2010: Donkey Kong + Rabbids except it's not called that. [3:08 PM] RawkHawk2010: Barrel cannons. [3:09 PM] RawkHawk2010: aka that robot cursor thing from the main game. [3:10 PM] RawkHawk2010: Honestly, the only big problem with any of this seems to be...the Rabbids. [3:10 PM] Ludwig Von Koopa: Back; got milk. [3:10 PM] RawkHawk2010: But that problem is quite huge. [3:11 PM] Sooper Sekrit Agent Wendy: is it like that too in the main game? [3:11 PM] RawkHawk2010: This Rabbid Cranky is more the protagonist than DK. [3:11 PM] RawkHawk2010: DK is dead last in line. [3:11 PM] Ludwig Von Koopa: His cane is Espresso? [3:11 PM] RawkHawk2010: Oh, didn't notice that. [3:11 PM] RawkHawk2010: Yeah looks like it. [3:11 PM] RawkHawk2010: Gonna assume it's not a generic ostrich. [3:12 PM] RawkHawk2010: It has shoes I think. [3:12 PM] RawkHawk2010: @Sooper Sekrit Agent Wendy Gameplay is here. [3:12 PM] Ludwig Von Koopa: "Half the size of the main game"
[3:13 PM] RawkHawk2010: Rabbid Peach is gross. [3:13 PM] Ludwig Von Koopa: Rabbid Peach's description mentions Mari0. 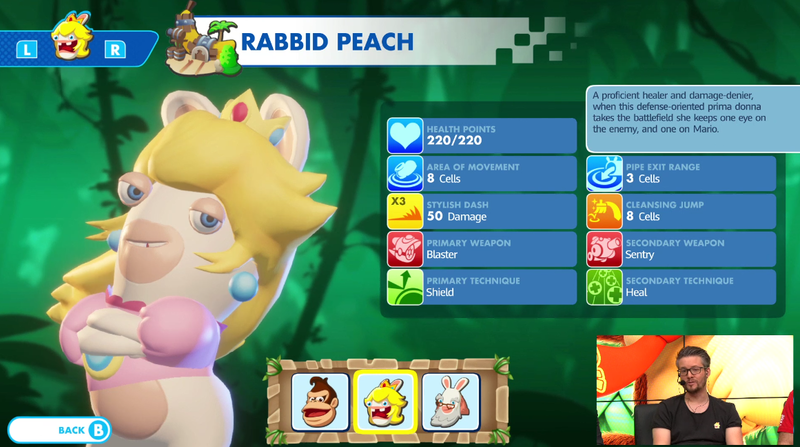 Rabbid Peach is everywhere. But there's no Mario for her to keep an eye on this time. [3:13 PM] Ludwig Von Koopa: Despite Mari0 not being here. [3:14 PM] RawkHawk2010: Squawks banana. [3:14 PM] Ludwig Von Koopa: "Inspiration taken from the Donkey Kong games." [3:14 PM] Ludwig Von Koopa: "officially licensed Expresso ostrich merch"
[3:15 PM] RawkHawk2010: Pikachu still screeching in the background. [3:15 PM] Ludwig Von Koopa: Maybe it's part of a trailer on repeat. [3:16 PM] Ludwig Von Koopa: In terms of story they refer to smugglers. [3:16 PM] Ludwig Von Koopa: What's being smuggled? [3:16 PM] Ludwig Von Koopa: Bananas? [3:16 PM] Ludwig Von Koopa: So is that Koopa Kingdom's banana supply? [3:17 PM] RawkHawk2010: Well I like DK's weapons here. [3:17 PM] RawkHawk2010: Basically a huge extension of what the Coconut started. [3:18 PM] RawkHawk2010: Why is the Rocket Barrel theme playing in the background somewhere? [3:18 PM] RawkHawk2010: Is it on Smash? [3:18 PM] RawkHawk2010: I doubt it's in Rabbids. [3:20 PM] Ludwig Von Koopa: So there's ink here, too? [3:20 PM] Ludwig Von Koopa: Everyone wants to have ink in their games now. [3:21 PM] Ludwig Von Koopa: DK punched out Cranky Rabbid. [3:21 PM] RawkHawk2010: Fortunately that wasn't the real Cranky. [3:22 PM] RawkHawk2010: Would be extremely out-of-character. [3:24 PM] RawkHawk2010: Why did Rabbid Cranky do like, three moves in a row? [3:25 PM] RawkHawk2010: I know he at least tarred someone and then attacked directly afterwards. [3:28 PM] Ludwig Von Koopa: Banana warp pipe? [3:30 PM] Ludwig Von Koopa: They put a lot of effort into different objectives for this DLC. [3:30 PM] Ludwig Von Koopa: Even "musical puzzles". [3:30 PM] RawkHawk2010: Just did a literal yawn. [3:30 PM] Ludwig Von Koopa: I thought you liked this content. [3:30 PM] Ludwig Von Koopa: Segment over, but they have "something else coming up." [3:31 PM] RawkHawk2010: Sure would like to know. [3:31 PM] RawkHawk2010: So I can decide whether I use this opportunity to go become a new man. [3:31 PM] Ludwig Von Koopa: Huh? [3:31 PM] RawkHawk2010: Euphemism for bathroom. [3:31 PM] Ludwig Von Koopa: KoopaTV's? [3:31 PM] Ludwig Von Koopa: ...OH. [3:32 PM] Ludwig Von Koopa: Okay, yeah, go. [3:32 PM] RawkHawk2010: Nah can't. [3:32 PM] Ludwig Von Koopa: You jammed or something? [3:32 PM] RawkHawk2010: Probably lol. [3:32 PM] RawkHawk2010: It's been days. [3:32 PM] Ludwig Von Koopa: Let's talk about this off-log. [3:33 PM] RawkHawk2010: That Rabbids segment felt longer than it really was. [3:34 PM] RawkHawk2010: I said XC2 isn't exactly fun to watch if you haven't played the game but Rabbids is worse. [3:35 PM] RawkHawk2010: For both I mean battles-wise. [3:36 PM] Ludwig Von Koopa: 'ey. [3:36 PM] Ludwig Von Koopa: Segment of newness. [3:36 PM] Ludwig Von Koopa: Super Smash Bros. Ultimate. [3:36 PM] Ludwig Von Koopa: "Speedier characters of the roster"
[3:37 PM] Ludwig Von Koopa: Yeah this is filler. [3:37 PM] Ludwig Von Koopa: I really wanna know about Little Mac for this. [3:37 PM] RawkHawk2010: Still reacting. [3:37 PM] Ludwig Von Koopa: Since it looks like Little Mac got a buff. [3:37 PM] Ludwig Von Koopa: With his recovery. [3:38 PM] Ludwig Von Koopa: But they're in the no-pit Fire Emblem stage. [3:38 PM] Ludwig Von Koopa: You can dash dance in this game. [3:38 PM] Ludwig Von Koopa: And do anything out of dashes. [3:39 PM] Ludwig Von Koopa: No. [3:39 PM] Ludwig Von Koopa: But part of the appeal of wavedash is you can do anything out of it. [3:39 PM] Ludwig Von Koopa: But the wavedash has other properties too. [3:39 PM] Ludwig Von Koopa: Like being able to slide upon a landing. [3:39 PM] Ludwig Von Koopa: Including off a platform/to a ledge. [3:40 PM] Ludwig Von Koopa: Dude keeps trying to approach with Little Mac with aerials. [3:42 PM] Ludwig Von Koopa: You saw Little Mac just up-tilt out of dash. [3:42 PM] Ludwig Von Koopa: Before, you'd need to do perfect-pivots (which is complicated control-wise) to move into an up-tilt. [3:44 PM] Ludwig Von Koopa: Treehouser says Ultimate is faster than For Wii U. [3:45 PM] Ludwig Von Koopa: Watching this it feels like I'm just watching Super Smash Bros. For Wii U. [3:45 PM] Ludwig Von Koopa: But aesthetically modded. [3:46 PM] Ludwig Von Koopa: Uh...as expected. [3:47 PM] Ludwig Von Koopa: Even Bowser is more mobile. [3:49 PM] Ludwig Von Koopa: I didn't know the game was timed. [3:49 PM] Ludwig Von Koopa: Their Treehouse talking camera is over it. [3:49 PM] RawkHawk2010: It was? [3:49 PM] Ludwig Von Koopa: Well I didn't see the timer. [3:49 PM] RawkHawk2010: I saw it every time I looked up. [3:49 PM] RawkHawk2010: Maybe luck. [3:49 PM] Ludwig Von Koopa: Now FFA of Sheik, Little Mac, Sonic, and Fox. [3:50 PM] RawkHawk2010: Or maybe we're on different streams. [3:50 PM] Ludwig Von Koopa: How come I didn't see it before? [3:51 PM] RawkHawk2010: Well it blending in with the clouds isn't an excuse cuz Sakurai actually had the sense to use a bordered font. [3:52 PM] Ludwig Von Koopa: Little Mac now jumps in his Super Punch animation. 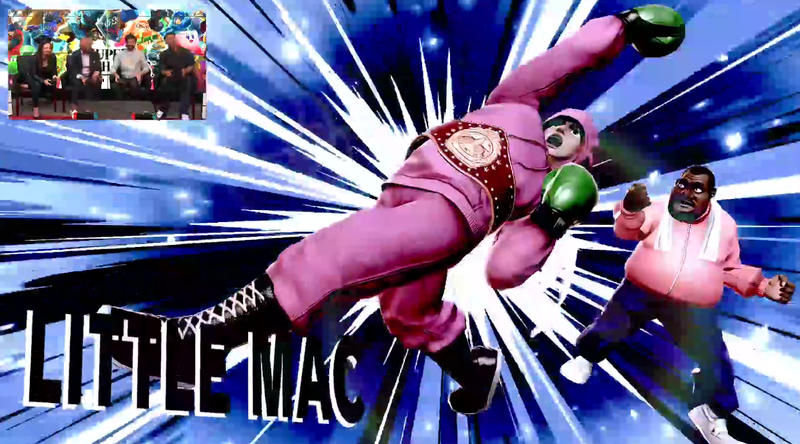 You're looking absolutely fantastic, Little Mac. Can't wait to play as your buffed (?) self! KoopaTV is excited about the next log, so hopefully you are too and stick around! The previous log dealt with some DLC content as well for already-existing games.